End Of February. End Of Winter ? We're having very nice weather right now. It's quite dry; it hasn't rained at all since before Ken left. We've had some mist, but no measurable precipitation. And the sun's been out. 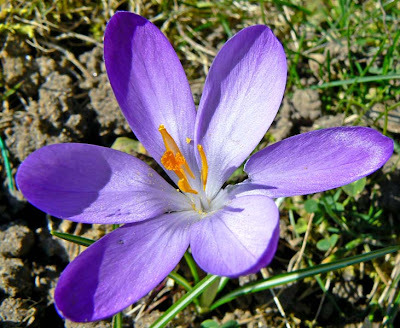 One of many backyard crocuses. They're spreading so we have more every year. I haven't had a fire for the last four nights. It does get a bit chilly, but nothing I can't handle with a blanket in the evening while watching tv. I use the central heating each morning, but hey, it's still February. Not for long. 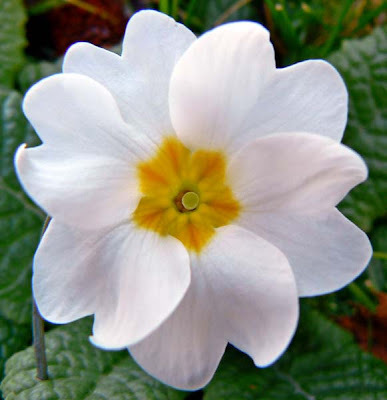 The primroses are starting to flower now. March starts tomorrow. And with the recent sun and mild temperatures have come the spring flowers. The cyclamen have been up for a few weeks, but now the crocus are showing up, along with the primroses. And we have a few perce-neige (snowdrops) in bloom as well. 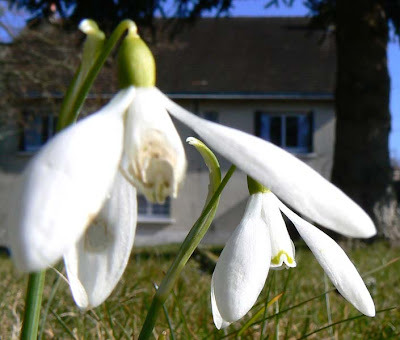 Perce-neige. Thankfully, we have no snow for them to poke through. I know that it's not spring yet. I know that it may get colder before it gets warmer. I know we have the giboulées de mars (March squalls) to look forward too. But I'm encouraged by the longer days, the strengthening sun, and the birdsong I hear each morning. Spring arrives in three weeks. Vivement le printemps! You've heard of potatoes au gratin, no? 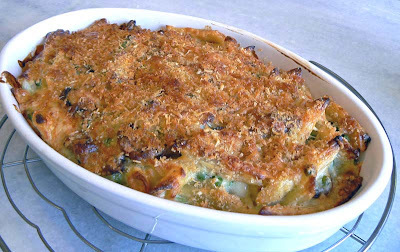 In French, a gratin is any dish that is baked in the oven then broiled so that the top forms a kind of a crust. Often, it is made with cheese that melts under the broiler, but not always. Gratin de penne, champignons, et petits pois. Making a gratin is a great way to use leftovers. You know that I made a lasagne last week. A few days later I ate penne pasta with the leftover meat sauce. Well, I had some penne left over, so on Thursday I made a gratin. For my gratin, I started with a bécahmel sauce. It begins with a roux of flour cooked in melted butter. Then you gradually add milk and stir, and that makes the basic French white sauce called béchamel. I added salt and pepper and a bit of grated nutmeg. Yum! Next, I added some grated cheese to the béchamel. I used cantal. At that point the sauce became a mornay. Well, almost. A classic mornay also includes egg yolk, but I didn't add any. My sauce was a cross between a béchamel and a mornay. No matter. Then I combined the leftover cooked pasta and the sauce. I mixed in about a cup of cooked peas and about the same amount of sautéed mushrooms. Then I put the whole mixture into a gratin dish, topped it with some more grated cheese and some breadcrumbs, and slipped it into a moderate oven for about forty minutes. The result was a gooey, tasty pasta dish with a crunchy crust on top. It's very much like a lasagne, like the one I made last week, but without tomato sauce or meat. And it's a very versatile dish. 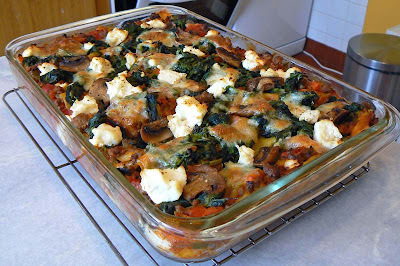 You can use whatever you have around, including many leftovers, to make a successful gratin. So go ahead and do one yourself and send me photos and recipes! 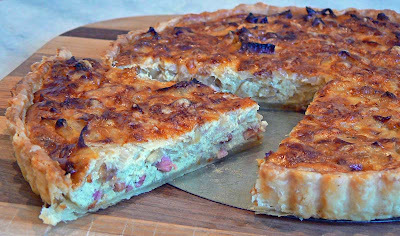 Wednesday's lunch was an onion quiche. A relatively simple affair, and tasty, too. The first step, as always, was to blind-bake a standard pâte brisée. Mine is made with just flour and butter. When that was done, I moved on to the filling. My onion quiche, ready to eat. Since this was to be an onion quiche, owing to the bunch of onions down in the pantry that need to be used, I peeled and sliced about five medium onions and set them aside. Then I sautéed some lardons (French smokey bacon), drained them, then used the grease to sauté the onions very slowly. I covered them, adding a bit of dry rosé wine to keep them moist. I used rosé because that's what I had open, but a good dry white wine would be the normal thing. Next up, I grated a bit of comté cheese. In the states, you could use any Swiss or a Monterey jack. You could also use a dry white cheddar, but I'd stay away from sharper cheddar because that might overpower the sweetness of the onions. Then it was on to the filling. I lightly beat four eggs and added about a quarter cup of crème fraiche. I salted and peppered this before grating in a bit of nutmeg. I added the cooked onions and most of the grated cheese and mixed it well. The sautéed lardons went into the bottom of the pre-baked shell, then I poured on the egg and onion mixture. The last of the grated cheese went on top and the whole thing went into the oven for about thirty-five minutes. It cooled on a rack for about ten minutes before I sliced into it. I served it with a green salad dressed in our home-made vinaigrette, accompanied by a local Touraine vin de pays. And there are leftovers for later on. I grew up calling this dish lasagna, spelling it with a final "a." In French it's spelled lasagne. Both words are Italian. The former is singular, the latter is plural. Since the word refers to the broad flat noodle used to make the dish, it makes sense that it should be plural; most lasagne dishes contain more than one lasagna noodle. Maybe we spelled it with a final "a" because both words are essentially pronounced alike, and the final bit sounds like an "a?" Assembled, ready for the oven. Whatever the spelling, I love lasagne and we make it several times a year. It's pretty easy and it freezes very well. There are so many ways to make a lasagne dish, including using a béchamel sauce in the place of tomato. It all depends what you've got on hand and what you feel like eating. I started out on Saturday by making a tomato sauce that included sautéed onion, shallot, garlic, carrot, and bell pepper. I added a can of roma tomatoes, some leftover tomato juice from the freezer, and some wine, salt, pepper, bay leaf, thyme, celery seed, and smoked paprika. Then I ground up some bourguignon that we also had in the freezer and sautéed it with s & p, smoked paprika, and cayenne. This got mixed into the sauce and simmered for a couple hours. Baked lasagne, ready to eat! In the meantime, I cooked some frozen spinach and cleaned, sliced, and sautéed some mushrooms. 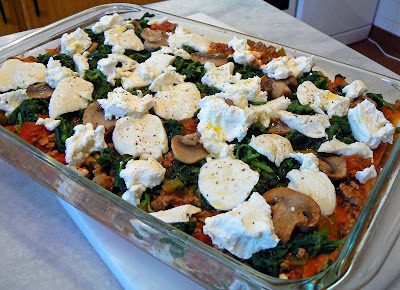 The spinach and mushrooms and sauce were all layered into the pan with the noodles and both mozzarella and ricotta cheese. Then it went into the oven and baked for about forty-five minutes. What a great lunch! And I froze most of it in two packages that will feed Ken and me for two meals in the month ahead. On Friday I thought I would make a pie. So, easily enough, I made a pie crust. My standard pâte brisée. I used the long tarte pan that I got in Paris last year. 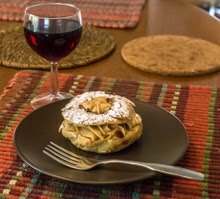 Ken found a recipe for amandine, a kind of pie made with an almond custard and pears. It's what I did not long ago, but I sliced the pears instead of using halves. 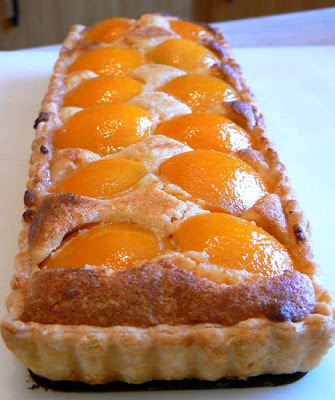 Since we had a can of peaches in the pantry, I thought I could do the tarte correctly this time using peach halves. And it worked wonderfully. So I'll be encouraged to do this again, whether or not I have fresh fruit. While fresh is always tastier, canned fruit can work wonderfully. It's just a different taste, but good nonetheless. By the way, happy Washington's birthday! Ooops, that was Sunday. Today is Callie's birthday! She is two years old today. So young, but still. A far cry from her first year of puppy-hood when I thought I would have to kill her. She's matured a lot, but she still has many of her puppy traits. And I'm constantly amazed at how she understands words. 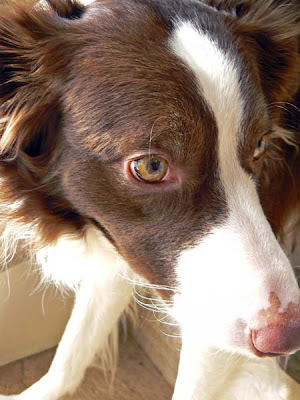 Border collies are known for being very smart dogs. 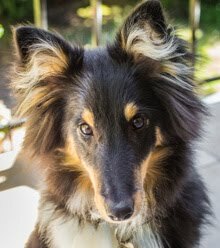 But most dogs are smart, aren't they? Or, at least, we think they are because they respond to us humans in a very recognizable way. And we wouldn't have it any other way, would we? Happy birthday, little dog. Many more. And, this being her birthday, she had me up at 5:30 am to go outside. Her little tummy was making gurgling noises and she did a little whimper thing every now and again. Can't ignore that. So it was up, lights on, semi-dressed, and out the back door. After about fifteen minutes of eating grass and who knows what else (I don't go out with her; it's two degrees out there), she came bounding back in the house. Lights off, back to bed for another hour and a half. But we're up now, updating the blog and waiting for morning light before going out for a walk. On Thursday I mentioned in my "Newsiness" section that I had a decision to make. Our daily bread is delivered, well, almost daily, here in St.-Aignan. The boulangère, or baker's wife, makes the daily rounds in her truck. She carries baguettes and pains, and a few other goodies, like goat cheese and croissants. Une ficelle. I added the fork for scale. She always takes special orders, in advance, of course. So, since I'm here by myself while Ken is in North Carolina, I've had to deal with the bread issue. I don't want to tell her not to come by, since I'm afraid that this delivery service might go away without enough demand. 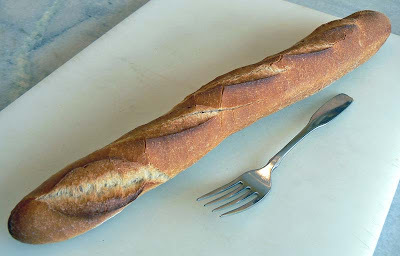 The issue is, that since it's just me at home, a whole baguette each day is more than I can eat. Some of it must go into the freezer. 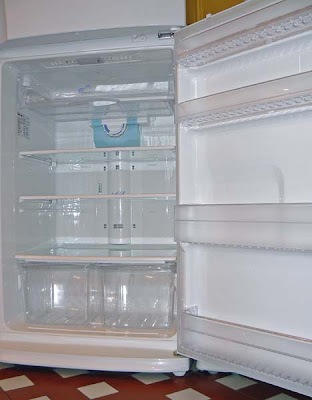 And we have enough stuff in the freezer now, without filling it up with extra bread. So I had to decide. Do I ask for a baguette and ask her to skip a few days delivery at my house, or do I ask her for just a half-baguette so that she needs to drive up the hill every day? During the winter, we are her only clients up here on our hill. So what did I do? I wimped out. I did neither. I got a whole baguette on Thursday (half of which went into the freezer), and I asked her to bring une ficelle on Friday and Saturday. A ficelle is a loaf half the weight of a baguette (125 grams vs. 250 grams), and it costs a bit more than a half-baguette. But it's a whole loaf. That means more crust, and I like the crust. And I'll probably ask her to continue with the ficelles until Ken gets back. Since it's only for a little while, I think that I can deal with the extra cost of a ficelle. You see, I don't want the baker and his wife to think that there's not a market for bread delivery. It's a nice service. And even though we pay a few cents more for delivered bread than if we were buying it at the shop, it's a premium that makes life in rural France such an amazing adventure: fresh bread delivered to the house five days out of seven. I can live with that. I'm starting to wonder, could I live without it? 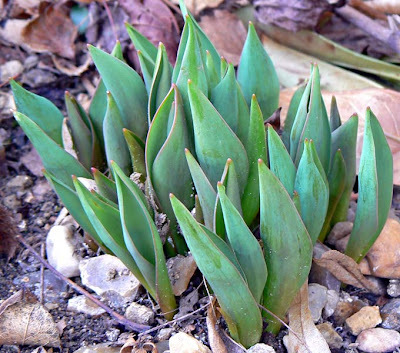 I think these are tulips coming up. The bulbs are coming up. 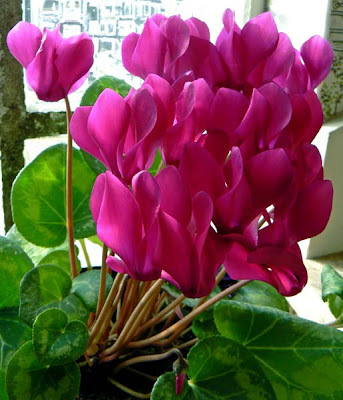 The cyclamens are up, too, and flowering. The primevères (primroses) are also up, but they're not yet flowering. It's a late year for them. The forsythia are in full bud. It won't be long before we have bright yellow flowers. It's nice to be enjoying the benefits of longer days, especially when they're sunny ones. That's rare, this time of year, so we enjoy 'em when we get 'em. Our back yard is surrounded by vineyards whose grapes go into some fine Touraine A.O.C. wines. We also have a few old grape vines inside the yard. These are not wine grapes, however, but several varieties of table grapes. Pruned table-grape vines in the back yard. 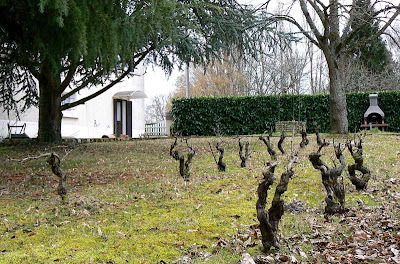 They are old vines, probably planted at the time the house was built in the late 1960s. When they were young vines, they probably produced wonderful crops of eating grapes. Since then, several large trees have grown up nearby, shading the vines and making any production quite meager. What's left of the two rows. Most years now, the few grapes that develop are quickly devoured by birds. Some of the vines have died, and I've yanked them out. The previous owner installed a nice set of posts and wires to support the vines year after year. At one time useful, they've lately become just a barrier across the yard and make it difficult to cut the grass around the vines. 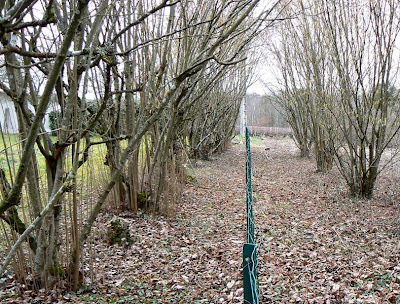 Hazelnut row. It's time to start pruning all those little suckers around the trunks. Our yard is to the left of the green fence. On the right is a little stand of woods, then vineyards. So, as the vines started dying, and a few have, I started yanking out the posts. 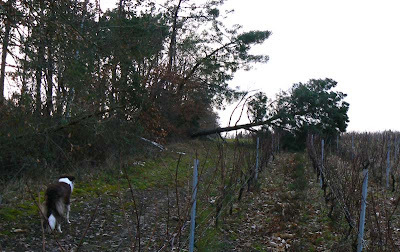 On Tuesday, after I did this winter's pruning, I took out the remaining posts and wires, leaving just the surviving vines. As long as they live, they get to stay. But grapes do best in full sun, and we just get barely enough of that every year without the added burden of shade from tall trees. These grapes' days are numbered. 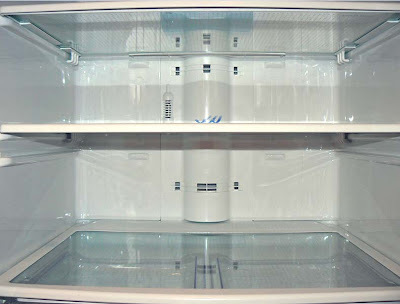 I followed through with my threat and emptied le frigo (the fridge) on Tuesday to give it a good clean. I won't tell you how long it's been since it's been done. Nor will I show you any "before" photos. Let's just say it wasn't pretty. It took a good two hours, taking each shelf and rack out, washing, rinsing, and drying them separately before putting it all back together. I used two sponges, a couple cleaning rags, kitchen towels, and a toothbrush. This was a job that required unplugging the beast, of course. At the end, I felt bad about putting the food back in. The interior looked so bright and shiny, uncluttered, almost gleaming. But in it all went. I didn't attempt the freezer compartment. That will wait for another day. Or year. On Monday I got to meet fellow American expat blogger (and cupcake princess) Leesa and her French husband Alex. 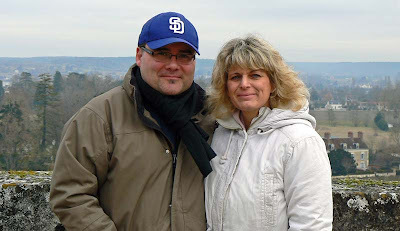 They were in the Loire Valley visiting some friends and had time to come down to St.-Aignan for a short walk and a coffee before heading on to their next adventure. 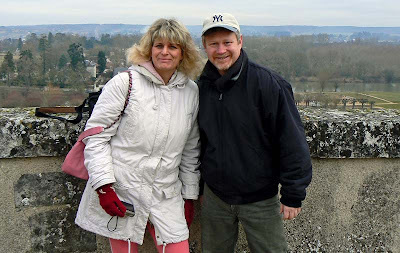 Alex and Leesa on the terrace of the château de St.-Aignan. I took Callie with me to meet them. Callie doesn't have a lot of experience riding in the car and walking around in town, so it was a good opportunity to improve her skills. And Leesa had mentioned that she'd like to meet the famous Miss Callie. How could I refuse? Since it's February, it's cold. That makes being outdoors a little bit of a challenge with coats, hats (Alex and I each sporting our baseball caps, one from each coast), scarves, gloves, cameras, and dog. But the temperature was above freezing and there was no wind or precipitation, so we did all right. Leesa and Alex in the café - it was nice to get in from the cold. It was really great to meet them both. We walked around town a little, to the main place, to the church, and up to the château. Alex noticed that some stones had fallen from two parts of the château - it must have happened during our big windstorm last week. The stones lay broken on the ground where they fell and the areas were roped off. One of the portions that fell was a beautiful sculptured window element from the renaissance wing of the castle. 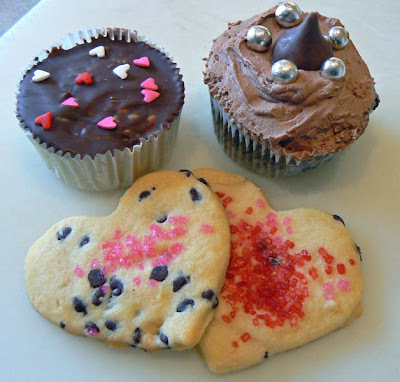 Cupcakes and cookies made by Leesa. Yum! We stopped in a café and had, well, coffee, and chatted for a while. Then it was time to say good-bye. Leesa and Alex headed off to visit the Clos Lucé in Amboise. I'm sure there will be photos on her blog! This is all that's left of the wood that I cut for this season. It's not much, unless it gets warm pretty quickly. It's just about one-third of a row. I started with nearly four rows. What's left of this season's wood pile. 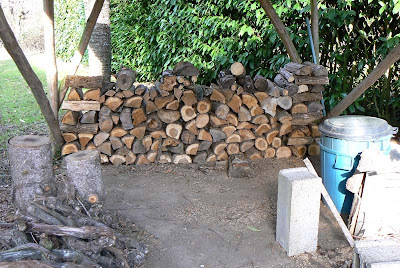 I have a ton more wood, but it needs to be cut with a chainsaw into stove-sized pieces. I'm not wanting to do that until later this summer, in preparation for next winter. So we'll see how it goes. We're at that point in the season where I'm feeling tired of building the daily fire. Even though the wood is cut, I still need to go out every day, regardless of wet and cold, and split a few of the pieces with an axe to make them small enough to burn. In the fall, it's fun and exciting and new. But come February, ugh, what a chore (and that includes cleaning the ashes out of the stove every morning-after). 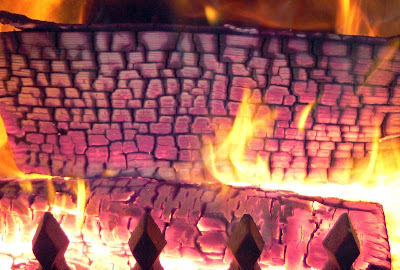 As the days get longer and warmer, the fires get shorter and smaller. I skip the odd day, then more days, and before I know it, it's the spring of the year and I'm not making fires any more. If you were ever wondering what it looked like inside our wood stove, here is your answer. A nice fire to warm the living room. I don't know why I took this picture, but what the heck. It sure was hot. Maybe it was the little glowing rectangular shapes. Maybe it was the wine. Who knows? The stove has a glass window in the front so we can see the fire. Cozy. Ken brought a couple of pears home from the market the other day and suggested that I might make a tarte with them. Always a good idea! 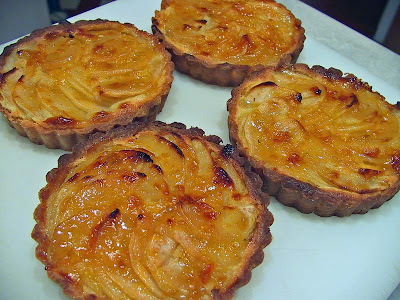 Individual almond-pear tartes. Ken took the photo. I remembered that we had some leftover pâte sablée that had I made around the holidays and frozen. While it thawed, Ken put together an amandine filling with butter, sugar, eggs, ground almonds, a bit of flour, and some kirsch. I sliced the pears while the shells were having a pre-bake. The filling went into the blind-baked shells, then the sliced pears went on top. 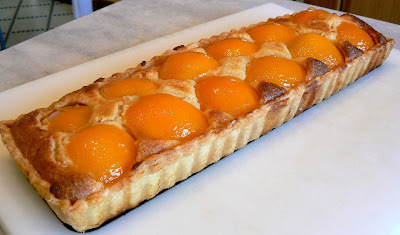 The tartes finished in the oven and I glazed them with apricot jam. What a yummy mid-week dessert. Twice. This is where I walk the dog. It can be dramatic at times. It can be subtle. It can be boring. Well, no. It's seldom boring. Thankfully, this tree was not in our yard. It's out in the vineyard. Still, there is damage. Some vines look to have been crushed. 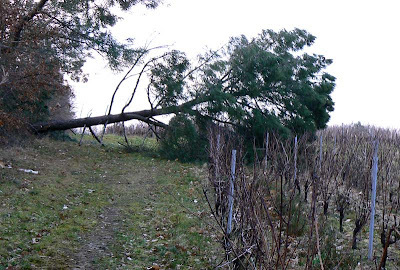 But I'm not sure; they could be ok.
A pine tree blew over in the storm. Still, it's just a few. I'm sure that there will be some insurance coverage for what it takes to clean up and re-plant the vines that were damaged. It's better that it happened out there in the vineyard than closer to the surrounding houses. We had a bit of a storm Monday night. It was predicted, and the weather people said it wouldn't be as bad as the one they had in southwestern France in January. And it wasn't. But still. They said it would be a very windy storm, with hurricane force winds as far inland as where we live. Scary. Ken and I took our precautions. We checked around outdoors to be sure that everything that could blow around was secured. Car in the garage, check. Garbage can in the garage, check. Tarps weighted down with logs, check. In the evening, we closed every shutter on the house and garden shed. By the time bedtime came, the wind had kicked up, but it wasn't really scary. Yet. But by midnight, the gale was blowing. Ken was sleeping soundly, but I was nervous and couldn't sleep. I kept having visions of our roof tiles blowing off, or one of our trees blowing over. The bedroom window kept moving violently in its frame as if it might blow out, striking me on the head and sending me off to Munchkin Land. I had visions of me and Callie running from the wicked witch of the West. At about half past midnight, the power failed. It flickered a few times, and finally went out. I got up and went down to the utility room to check the circuit breakers (they were ok), turned off the modem to guard against power surges, and went back to bed. I should have unplugged the fridge and freezer, too, but it was the middle of the night and I wasn't thinking all that clearly. I was scared and nervous. I felt my heart pounding and thought that I'd get no sleep at all. Callie was moving around the house, trying to find a peaceful place to sleep. I tried to calm myself down by thinking good thoughts. "I could wile away the hours, conferring with the flowers, consulting with the rain..." That didn't work well at all. I finally put a pillow over my head to deafen the wind noise and eventually fell asleep. We all woke up close to eight o'clock in the morning, with the wind still howling, but less so. Or at least it seemed less when we opened the shutters and let in the morning light. Everything is scarier in the dark. So we got up. Since the power was out, we had no heat. Our heater works on fuel oil, but it needs electricity to fire up and pump the hot water through the radiators. I took Callie outside to do her thing and proceeded to chop some wood to build a fire in the wood stove. It wasn't raining any more. I looked at the roof; no tiles missing. Ken made a pot of tea. We have a gas stove, so lighting it with a match was easy to heat water. And we waited. We had talked about the coming storm on Monday afternoon and realized that we had some leftovers in the fridge that could be heated up on the stove for lunch, so we didn't have to worry about cooking if the power went out. And we had batteries for the radio to listen to the news and other programs if we needed to. And we needed to. Not that the news gave us any, well, news. Just a lot of chat and music. Oh well. The power stayed off until six pm on Tuesday evening. Not a catastrophe, by any means. No poison poppies, no flying monkeys. We were dry, warm, and we ate a good lunch. We even decided to make a batch of crêpes for dessert in the mid afternoon. But it sure was nice to have electricity again when it came back on. Just in time for nightfall. Oh Internet! Oh E-mail! Oh TV! We're such wimps. But, even without electricity, there's no place like home. 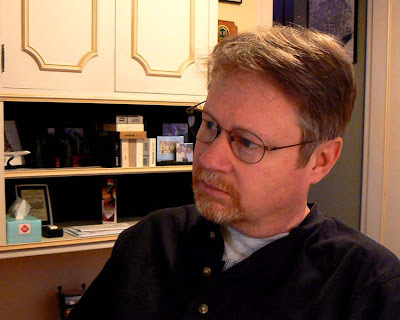 I just want to give a shout out to my readers in Albany, NY, and to those who have visited there. Albany is my home town, and every time I go back it tugs a little at my heartstrings. 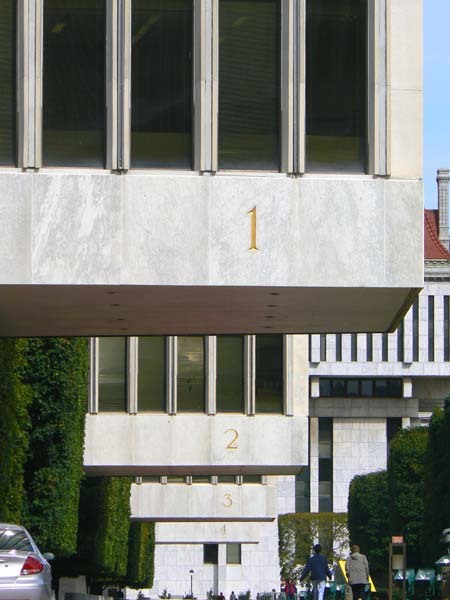 A glimpse of the Albany skyline. I left Albany when I was twenty-one to spend a year in Paris. After that, I went to Washington, DC, for four years, then moved west to San Francisco. 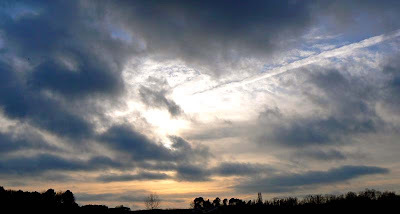 After seventeen years there, I came to live in rural France. I once worked in Agency Building #1. In 1977, not long after it opened. But from time to time, I've gone back to Albany. From my point of view, the place has kept its feel. It hasn't grown into a megalopolis. Far from it. Thank goodness. As a city planner by profession, I've seen what's happened to the big urbanized areas in the southern and western United States, and it ain't pretty. I'm glad that Albany was spared that fate. One drawback that I can think of is that the city suffers through the northeastern winter. That can be hard to take. The "new" Dunn Memorial Bridge over the Hudson River. I must say that the old one was much prettier. 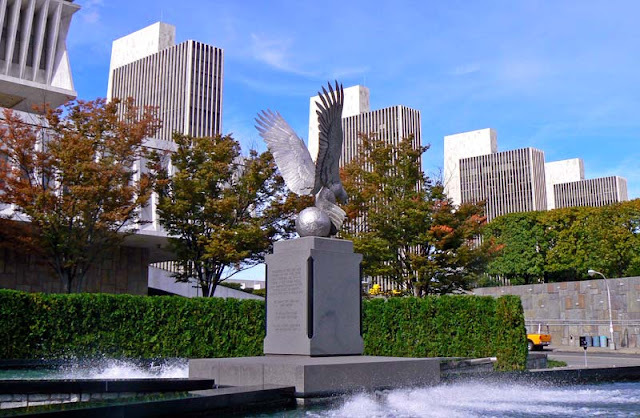 Albany's still a small city, even though it's the capital city of New York State. And while it lacks some of the verve and edge of a more cosmopolitan place, it more than makes up for it in livability and charm. And besides, Boston, New York, and Montréal are very close when you need a dose. Just a short train ride or drive away. Who could ask for more? If I were to move back to the United States, I would seriously consider going back to Upstate New York. It's a great place. Now I feel a bit more civilized. I like having my hair cut, but I don't like getting my hair cut. Does that make any sense? Looking very studious in the study. And it's not that the whole thing has to be done in French. I never really liked it back in the states, either. The salon, the chit-chat, the constantly seeing myself in the mirror, etc. But we have found a woman right here in town that is very nice, very low-key, and she does a great job. At least we both think so. As long as you don't go on Saturday. She's very busy on Saturdays and I think she goes too fast and the cut isn't as good as it normally is. So we avoid Saturdays. But, since we don't have day jobs, that's not a problem. Some of our visiting friends know her, too, as we've referred them for haircuts. Her prices are very reasonable. And for those of you who don't know, her name is Madame Barbier. That's Mrs. Barber, in French. I kid you not! You may have had these or you may have seen them on a menu. 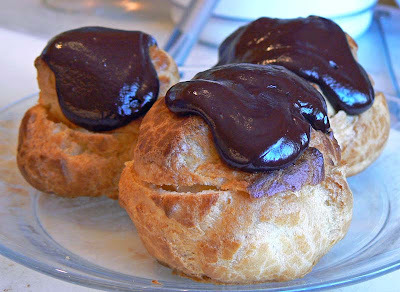 Profiteroles are a classic dessert in France made from pâte à choux (cream puff pastry). I saw somebody make them on tv recently, so I thought I'd give it a go. My baked puffs cooling on the rack. 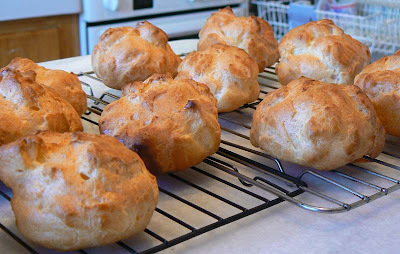 I read that the name of the pastry, pâte à choux (literally, cabbage pastry), is a deformation of the original pâte à chaud (hot pastry). The origin of the pastry is attributed to one of Catherine de Médicis' chefs, who made the dough and dried it out on the fire before baking it. I also read that it's called that because the puffs look like little cabbages. My recipe comes from Julia Child and it is extremely simple. First, you bring some water, butter, sugar, and salt to a boil. You remove it from the heat and stir in some flour. When the mixture is smooth, you stir in eggs, then put the pot back on the heat and stir some more to dry it out a bit. This stage goes pretty quickly, which is why I didn't take any pictures of it. The puffs are sliced open to dry. Next, you put the dough into a pasty bag and pipe it onto a baking sheet in little round shapes that you then smooth out with a brush dipped in water or egg. These go into a moderately hot oven for about twenty minutes, then you poke a small hole in each puff with skewer to let the steam out and bake them for another five or so minutes. 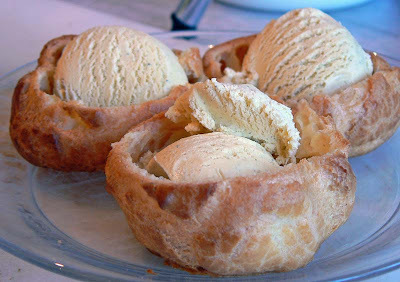 Fill each puff with a scoop of vanilla ice cream. 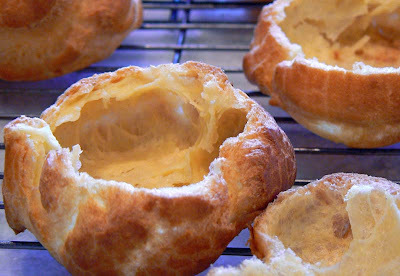 After they've cooled a bit on a rack, slice the top third off of each puff and open them up. Scoop out any soft dough and let them dry a little more. Then fill them with vanilla ice cream, put the lids back on, pour chocolate sauce over them and serve. Top with chocolate sauce and serve. A standard portion is three profiteroles. I made twelve puffs. That means we had them two days in a row. And, since I made them in France, they have absolutely zero calories. A nice thing about fall around where we live (and I'm sure other places, too) is that in certain areas you will find whole patches of wild cyclamen in bloom. One such place is up at the château in St.-Aignan. We have these little cyclamen in our yard as well, but they don't flower in the fall. Ours are spring bloomers. So it's right about now that the cyclamen in our yard are starting to put up their purple blossoms. Of course, we happen to have a couple of hot-house bought specimens indoors. These are much larger than the outdoor variety, and they seem to bloom through the winter. This is a current photo of one of them showing off it's glorious purple color. I started learning French in 1970. I think I may now be about half-way through. Ken and I were innocently watching a nature show on t.v. last week when another language learning opportunity presented itself. The host, Nicolas Hulot, and his spelunking friend were exploring a cave and remarking on the spectacular stalactites and stalagmites they encountered. Mr. Spelunker explained how the 'tites and 'mites formed, noting that there were many influences on the size and shape of each. Among the influences he mentioned were the rate of water flow, the mineral content of the water, air currents (or lack thereof) in the cave, and weightlessness. Whoa.... weightlessness? After letting this go by a couple of times, I asked Ken: why the heck is he talking about weightlessness in a cave? Certainly that can't be right. We used the remote to go back and listen again. Then it all became clear. Mr. Spelunker was saying that gravity was the primary force in the creation of stalactites and stalagmites. This is yet another example of how context is so very important in understanding what you hear. We ring in February with a new Periodic Puppy Pic, taken just a few days ago on the stairs. Callie gets kind of bored in winter. It's too cold and wet for her to be outside much. Not that she would mind, but she doesn't want to go out by herself. She wants us to be outside with her, interacting, and we're just not into hanging out outdoors when it's cold and wet. What we need is doggy internet. Callie@puppy.dog. I read this once: On the internet, no one knows you're a dog. She gets two good walks every day, so there's plenty of outside time and exercise. 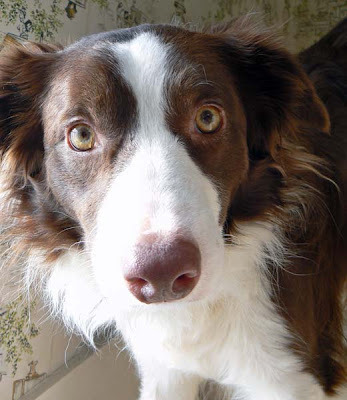 But, being a border collie, she naturally wants more. In summer, we're outside a lot more, and we keep the doors open, so she can go out and come back in at will. That's why it was so nice on Friday to be out burning in the yard. She got to hang out with us outdoors and chase the occasional stick that we tossed around. Good dog.